By Jim Dower: In an effort to get more time to finalize the Deontay Wider vs. Tyson Fury rematch, the purse bid for the fight, which was scheduled to take place on Tuesday, has been postponed for one week by the WBC. The management for Fury and Wilder asked the World Boxing Council to have the purse bid postponed so that they could work on getting the fight deal done. “We have extended (for) one week the free negotiations, per their request,” WBC president Mauricio Sulaiman said to ESPN.com. The Wilder vs. Fury II rematch is expected to take place in 2 to 3 months in April or May in either Las Vegas, Nevada or New York. Wilder’s manager Shelly Finkel is confident that the fight negotiations will get done, and there will be no need for a purse bid. Finkel is upbeat about the direction the negotiations are going in, according to ESPN. A purse bid would work well for Wilder, as he would get a 60-40 split of the revenue. If the Wilder vs. Fury II fight does go to a purse bid, there’s a chance that Matchroom Boxing promoter Eddie Hearn will bid on the match in hopes of winning it, and then placing the fight on DAZN rather than on FOX or SHOWTIME. The purse bid was scheduled to take place on Tuesday afternoon at the WBCs headquarters in Mexico City. It’s unclear whether the WBC will grant a second postponement of the purse bid if the two camps are still unable to get the fight negotiated in the seven days that were given. It would obviously be a bad sign if the fight isn’t finalized within that seven-day period. It’s believed that the 30-year-old former IBF/WBA/WBO heavyweight champion Fury (27-0-1, 19 KOs) wants a better deal than what he got the last time he fought Wilder on December 1 at the Staples Center in Los Angeles, California. That fight was scored as a 12 round draw. The scores were 115-111 for Wilder, 114-112 Fury, and 113-113. Fury and a lot of boxing fans thought he had done enough to deserve the win. Wilder’s strong surge in the championship rounds was the deciding factor in the judges scoring it as a draw. Wilder knocked Fury down in the 9th and 12th rounds. 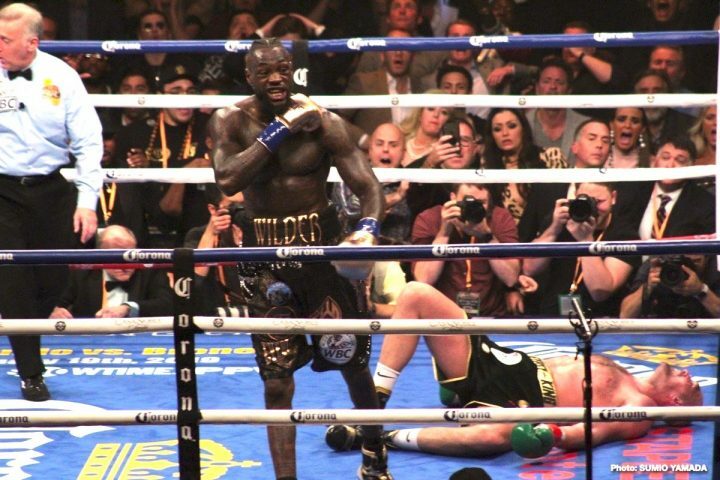 Although some of Fury’s fans felt both of those rounds should have been scored as even rounds due to Fury fighting well, the judges gave the rounds to Wilder. The fight brought in 325,000 pay-per-view buys on SHOWTIME PPV, which were good numbers. The WBC ordered the Wilder vs. Fury 2 rematch to take place. Both guys wanted the fight, so it really wasn’t necessary for the WBC to order the rematch.